PUMA V8300 Vertical Turning Center offers turning diameter of 830 mm, a work height of 750 mm and a swing-over-saddle of 740mm. Unit provides spindle speed of 2000 rpm and torque of 2592 Nm. Product is equipped with 37 kW high power spindle motor and column integral-type box guide structure. 15 in. turning center features an optional 12 station ATC magazine and slant bed. Equipment comes with coolant system with 77 gallon tank capacity. 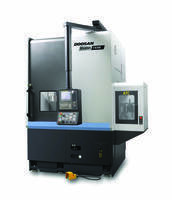 Doosan Machine Tools presents the new PUMA V8300 Vertical Turning Center with an automatic tool changer (ATC). The PUMA V8300 is a new generation 15-inch class vertical turning center with a larger work zone, increased rigidity and enhanced user convenience. It is available in right or left hand versions. The PUMA V8300 offers the largest work zone in its class, with a maximum turning diameter of 830mm (32.7“), a maximum work height of 750mm (30”) and a swing-over-saddle of 740mm (29“). The adoption of a standard 37kW (50hp) high power spindle motor and a column integral-type box guide structure ensures heavy duty, stable, dependable turning performance. The high-reliability, servo-driven turret maintains high accuracy during long-term machining. The PUMA V8300 has a maximum spindle speed of 2000 rpm and maximum torque of 2592 Nm (1912 ft-lbs). The PUMA V8300 comes with an optional 12 station ATC magazine, a feature not usually found on turning centers in this class. The ATC supports Capto C6 tooling and is available for all 12 stations of the turret. The tools remain safely out of the way when not in use, providing superior tool management and much easier maintenance. The PUMA V8300 Series is designed with a slanted bed and an improved flushing function for unhindered chip disposal, and expanded coolant system features a 290 liter (77 gallon) tank. It also has an ergonomically designed operation panel that swivels and is height-adjustable and movable for enhanced user convenience. For more information on the PUMA V8300 or any other Doosan machine tool, please visit www.doosanmachinetools.com or call 973-618-2500.